Thus we offer, especially to our young people, a brief summary of our charism. Our Holy Mother St. Teresa of Avila was endowed by the Holy Spirit with mystical graces, charisms, which led her to reform Carmel. Her charisms, handed down to us, are lived, preserved, deepened and developed constantly in harmony with the Body of Christ, the Church. St. Teresa directed the lives of the reformed ‘Discalced’ Carmelites toward prayer and the contemplation of the things of God. All observe the Evangelical counsels of Chastity, Poverty and Obedience according to the Primitive Rule. The community is small, a family centered on love for the Lord and sisterly charity. The prayer, work and entire life of the Carmelite is directed toward the service of the Church and the salvation of souls. In order to fulfil the vocation to contemplation in prayer and in a life which aims at union with God, we maintain faithfully, the papal enclosure of our monasteries, according to St. Teresa’s charism. 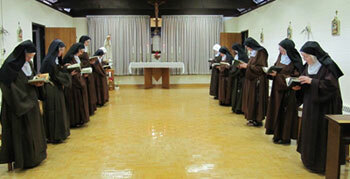 The Discalced Carmelites are called to a hidden life in union with God, in friendship with Jesus Christ and filial devotion to the Blessed Virgin Mary of Mount Carmel. With Christ as her unseen companion, the cloistered nun makes her hidden journey through life to a Fatherland, not of this earth. Where there is true love for God, the best investment of our time is to spend it in His Presence.